July 11, 2016  Tim Duncan says he is retiring from the San Antonio Spurs after 19 seasons with the franchise. He helped the team win five NBA titles. November 26, 2014  Just in time for Thanksgiving, commentator Frank Deford describes his gratitude for everyone's favorite team in any American sport. 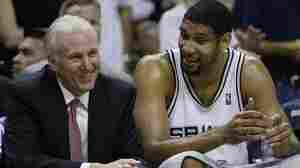 The Spurs, he says, are gentlemen, do right and are beloved by all. June 15, 2014  The San Antonio Spurs handily defeated the Miami Heat 104-87 on Sunday night, bringing the two-year title reign of King James and the Heat to an end. 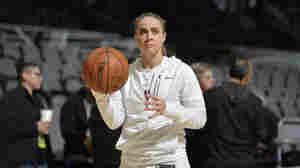 June 21, 2013  After a heart-pounding, seven-game series that vacillated between teams, the Miami Heat prevailed over the San Antonio Spurs 95-88 on Thursday. 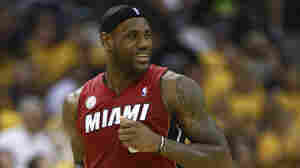 James earned the NBA Finals MVP for a second year in a row. 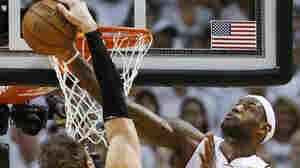 June 20, 2013  Like the contest between the Miami Heat and San Antonio Spurs, the effort to pass a comprehensive immigration bill in Congress is proving wildly unpredictable. June 19, 2013  The Heat won in overtime on Wednesday night in what LeBron James called "the best game I've ever been a part of." June 17, 2013  The 114-104 win against the Miami Heat put the San Antonio Spurs one win away from their fifth NBA title. June 14, 2013  The game served as a dazzling display for Miami's Big Three, who had an offensive awakening. Game 5 is in San Antonio, before shifting to Miami for the home stretch. 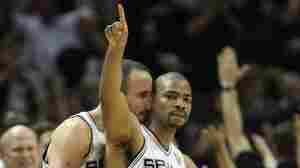 June 12, 2013  On the way to a 113-77 victory, San Antonio hit an NBA Finals record 16 shots from 3-point range. But Spurs point guard Tony Parker is nursing a hamstring injury. If he can't play, San Antonio could be in trouble. June 10, 2013  The NBA finals are now even. 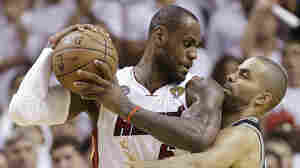 Game three of the best-of-seven series between Miami and San Antonio is set for Tuesday night. 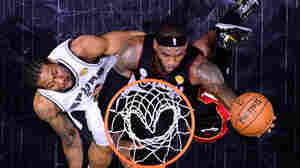 As for Sunday's game, there's video of a fourth-quarter highlight: LeBron James' rejection of a slam dunk attempt by the Spurs' Tiago Splitter. June 7, 2013  The Miami Heat won't be sweeping the San Antonio Spurs, as many analysts predicted. In fact, the Heat's path to the championship just got more difficult. After Sunday's game in Miami, the series goes to San Antonio for (if necessary) three straight games. June 6, 2013  As the Miami Heat and San Antonio Spurs face each other, here's a tip sheet. Their best-of-seven series starts Thursday night in Miami.